Do you live in the Ossining, NY, area and think your child might need braces? At Glaser Orthodontics, it is our goal to provide exceptional treatment and to make visiting our office a fun and comfortable experience. Dr. Barry Glaser and his entire team is dedicated to your child’s health and happiness; he looks forward to getting them on the road to an ideal smile and bite. With many different state of the art treatments available such as Invisalign, the staff at Glaser Orthodontics has the knowledge and experience to give your child the sensational smile they deserve. Find out how we create amazing smiles in Ossining and all over Westchester County! Contact our office now to schedule a free consultation! We can’t wait to lead you on the road to a better smile! Deciding to seek orthodontic treatment can be a big decision. Many children, as well as adults, often unknowingly begin to see many oral issues that may be associated with an orthodontic treatment. These problems are less obvious than just simply crooked teeth, and they do need attention. Dr. Glaser recommends to look for the following signs when assessing if and when you will need treatment. Each of these problems can be a signal of the necessity of braces. When looking for treatment options, Dr. Glaser offers many different options that can solve any and all of the issues. 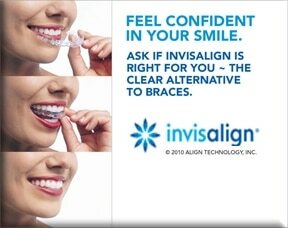 Invisalign is a clear alternative to braces that can solve many of these cases. Clear braces, as well as traditional braces, can also be a solution. There are also many orthodontic appliances such as permanent retainers and palate expanders that can play a role in solving oral difficulties. For more information, contact the Cortlandt Manor offices of Glaser Orthodontics at (914) 739-6400 or email us at info@glaserortho.com.